Bell’s Books 536 Emerson St., (650) 323-7822; . M-Thur 9:30-5:30, F 9:30-9, Sat 9:30-5. Family-owned since 1935, this small and delightful old-fashioned book shop stocks out-of-print books, antique prints, and a selection of new books. Books are stacked high, and related gift items are found here and there in appropriate sections. City of Ten Thousand Buddhas 4951 Bodhi Way, 4 mi. SE of town, across 101, (707) 462-0939. Daily 8-6. One of the first Buddhist temples and monasteries built in the U.S., this 448-acre facility operates on the grounds of a former state mental hospital. After passing through the ornate gate onto the property, stop at the office for a map and visiting rules. Monks and nuns are spotted walking and riding bikes, and peacocks roam freely. The temple (in the former gymnasium) has walls lined with perhaps 10,000 golden Buddha figurines in various sizes, and good-timing presents the opportunity to witness chanting. The property also houses a K-12 school and a university. A gift shop sells Buddhist souvenirs, including newly made carved-stone amulets. Jyun Kang Vegetarian Restaurant ((707) 468-7966. L W-M (12-3); $. Cash only. Reservations taken.) operates in one simple room with round tables. Decoration is limited to sporadic touches of lace. The name translates as "to your health," and the kitchen serves an Asian-style vegetarian/vegan lunch. Dishes are prepared without MSG, onions, garlic, scallions, leeks, shallots, or egg, but they do use hot red peppers and warn that the food is spicy but not hot. Recommended items include broccoli with cashews, mushrooms with greens, eggplant with basil, veggie noodles, veggie fried rice, curry noodle soup, mushroom and tomato soup, and sweet and sour tofu. Servers sometimes speak little English. When the restaurant gets crowded, diners are doubled-up at one table. Frozen food is available to go. Susan’s Place 15 Eureka St./Main St., (209) 267-0945. L-D Thur-Sun. Situated just off Main Street, this popular spot has a welcoming vine-covered courtyard that is especially inviting on a warm day. It is an atmosphere of colorful umbrellas and flowering plants as well as doves cooing in a small aviary. A small wine bar featuring mostly local labels is among the warren of delightfully designed spaces that provide diners comfortable seating and privacy, yet community. The menu items include an intriguing selection of soups, salads, and sandwiches, plus a don’t miss dessert—a divine walnut-caramel torte. Gallery 10 ((209) 267-0203. Thur-M 11-5.) 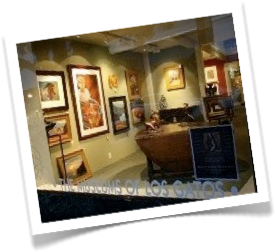 opens off the courtyard and displays paintings, ceramics, and jewelry by mostly local artists.